Well this wraps things up for the night. Fulham blaze their way up to 11th in the table with a polished performance that is rightfully being welcomed as their best of the season to date. Moussa Dembele got the Whites off the the ideal start, netting after just 117 seconds. Ben Pringle added a fine second from 18 yards and captain Ross McCormack made it 3-0 on 31 minutes, finishing what was a superb team move. McCormack's fourth came after QPR's leading scorer Charlie Austin limped off with a hamstring injury. It begs the question, just how costly was this defeat for QPR? As we bid farewell, join us again on Saturday for live text commentary of MK Dons v Derby County (kick-off 12:30 BST). Fulham captain Ross McCormack, told Sky Sports after scoring twice: "We want to challenge, we have always said that the play-offs are the aim and we are not going to change that. We are just going to go about our business." Moussa Dembele, Fulham's first goalscorer, told Sky Sports: "I think that was our best performance this season, we kept the clean sheet and scored some goals. "I'm enjoying having game time and having the manager believe in me." While we wait for reaction, have a look at tonight's match report from Phil Cartwright here. It will make for happy reading for Fulham fans, not so much for the QPR faithful. Will have reaction coming shortly. Sure to be a happy Fulham voice or two. And the whistle goes on what has been a magnificent night for Fulham in the west London derby. Nothing but misery for QPR as they wilted at Craven Cottage. They travelled just a few miles for this match, but there was truly a gulf in class. Ben Pringle close to making it five, turning to shoot from 18 yards but firing just wide. Surely this is Fulham's first Championship clean sheet of the season in their grasp now with a minute remaining. Fulham fans singing their team home on what has been a thoroughly convincing display. This west London derby has been a one-sided affair, which will come at a cost for QPR with leading scorer Charlie Austin injured in the second half. Five added minutes to come. Almost a fifth goal for Fulham as substitute Kay Voser gets a shot in from the edge of the box, but he puts it well over. Into the final minutes now, we will bring immediate post-match reaction from this west London derby. Victory for Fulham tonight will see them move back into the top half of the Championship. QPR look to slide one place to 10th in the league, with Fulham now just a spot behind. Cauley Woodrow, the man who had scored with every shot this season before tonight, goes close again. A great run from James Husband down the left and the ball finds the substitute, who fires low and hard but just wide of the post. With seven minutes of regular time left, the points are very much staying at Craven Cottage tonight. Question is, can they hang on for their first clean sheet of the season? First caution of the night goes to QPR full-back James Perch for his challenge on Ross McCormack. The Scotland international has been a handful all night. Might as well stop him by foul means. Kay Voser now comes into the action for Ryan Fredericks and that is all of Fulham's substitutes for the night now. 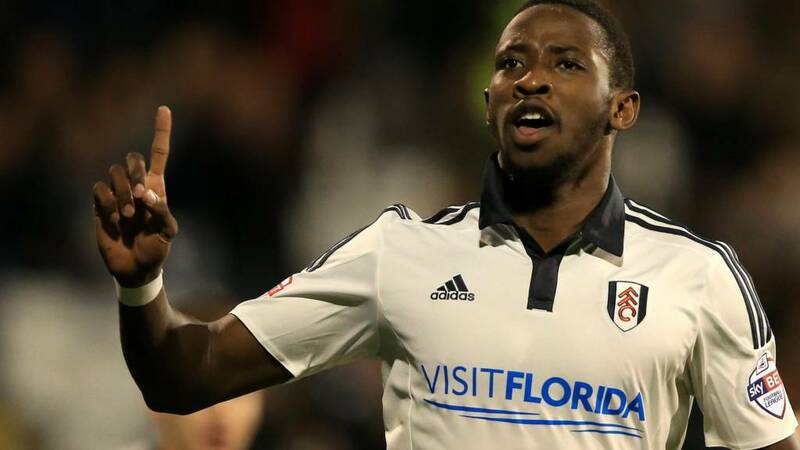 Another change for Fulham as Moussa Dembele is replaced Cauley Woodrow. Dembele's header put Fulham in front inside two minutes. And this is just what QPR need, as a remarkable statistic for Woodrow is that he has scored with both of his shots at goal this season. Another touch and we could be looking at 5-0? And it is that man Ryan Tunnicliffe again who makes QPR work. This time it is a fiercely struck 30-yard effort that Robert Green has to deal with. Just too close to the visiting keeper to be a real worry. Ryan Tunnicliffe has been immense in midfield. For all the attacking inputs he has given Fulham tonight, he has been tireless in his defensive duties. The Whites have suffocated QPR in the middle of the pitch and really have this game sewn up. Craven Cottage has been full of song all night. With Moussa Dembele netting early on, Ben Pringle lashing home wonderfully, Ross McCormack's double and a polished defensive performance, they should be hoarse with delight. Fulham with their first change of the game as midfielder Jamie O'Hara makes way for Lasse Vigen Christensen. Yes, at this stage last season Fulham had waved goodbye to Felix Magath and had yet to win in the league. Ross McCormack with a tap in finish for his second. Ryan Fredericks cuts the ball back looking for Moussa Dembele and an attempted clearance from Gabriele Angella comes back off the crossbar. McCormack is there to pounce for Fulham's fourth. Can Fulham keep a clean sheet? While Fulham are yet to record a clean sheet in the league, they got through two rounds of the League Cup without conceding before losing 1-0 to Stoke City on Tuesday. Prior to tonight, QPR had kept just one clean sheet in eight league games themselves. Tonight's performance highlights exactly why. And the Championship's top goal scorer Charlie Austin is replaced by Daniel Toszer. Seems that over extension trying to get a shot on goal was too much for Austin's hamstring. Is there any way back for QPR now that the man who has scored half of their league goals this season has been forced off? Charlie Austin is the latest QPR player to get treatment. Are we about to see QPR's greatest hope of fighting back into this one go off? Jamie O'Hara whips in a dangerous cross from the right across the face of goal and QPR's James Perch does well to deal with it, sending the ball out for a corner. Paul Konchesky showing no signs of pain as he has been heavily involved in a period of sustained pressure from QPR. However, his header straight at Andy Lonergan in Fulham's goal was hopeful at best as an attempt. Fulham's Richard Stearman makes a well-timed tackle on James Perch, and it needed to be as Perch ran into the box after some of the best build-up play that QPR have strung together all night. Paul Konchesky is getting treatment on his right thigh. Will manager Chris Ramsey be forced into another change? A night of a number of heavy hits for QPR so far. Netherlands international Leroy Fer is a half-time change, with the QPR midfielder replacing Jamie Mackie, who himself came on to replace Tjaronn Chery after 34 minutes. Mackie did take a knock moments after joining the action, surely that is the reason for the short stay? And Fulham kick the second half off. QPR have not won in the league since overcoming Huddersfield 1-0 on 29 August and that run looks set to continue. Fulham are poised to avoid their third defeat in six days, having gone out of the League Cup with a 1-0 defeat by Stoke City on Tuesday after going down 3-2 to Sheffield Wednesday in the league last week. If you have any views on tonight's game, get in touch using #bbcfootball on Twitter. There are nine games in the Championship tomorrow, starting with Derby's trip to MK Dons (12:30 BST). At 15:00 BST, leaders Brighton go to Bolton while third-placed Burnley host Reading. Middlesbrough and Leeds round things off on Sunday (13:15 BST). Follow live text commentaries of MK Dons v Derby and Middlesbrough v Leeds on the BBC Sport website. Huddersfield Town came from a goal down to draw with Nottingham Forest and deny Dougie Freedman's side a place in the top six. Town midfielder Emyr Huws cancelled out a first-half volley from Ryan Mendes. While the players take a break at Craven Cottage, let's look back at last night's Championship game and look ahead to the weekend's action. It's celebration time for Fulham at Craven Cottage. The home side have taken full control of this west London derby with three goals inside the first 31 minutes. Moussa Dembele's header put them in front after 117 seconds, and sweet left-footed efforts from Ben Pringle and Ross McCormack have given Fulham a comfortable half-time advantage. QPR, but for one missed chance that fell to Massimo Luongo just before Fulham's second goal, have rarely looked like scoring. Fulham kept QPR working to the very last in that half with a quick turn and shot from Ross McCormack flashing by Robert Green's post. The visitors have an absolute battle on their hands in the second 45 if they are to get something from this match as Fulham are doing it easy in this west London derby. The board flashes that two minutes of first-half added time will be played. Moussa Dembele, who opened the scoring inside two minutes, then tests Robert Green, making sure the QPR keeper is awake for these last few moments. If ever there was an attempted pass to sum up QPR's night so far, it is that hit-and-hope effort from defender Gabriele Angella that goes crossfield and nowhere. QPR will just want to see out the last few minutes of this half without going any further behind. Fulham manager Kit Symons has every reason to smile right now. Defensively, the hosts are calm and have not seriously been stretched. Their ability to counter attack has been astonishing at times. That third goal from Ross McCormack was proof of that, coming as QPR worked hard to take the sting out of the match by slowing the tempo of proceedings right down. QPR's Tjaronn Chery heads straight toward the tunnel, doesn't give any thought to joining his team-mates on the bench as Jamie Mackie takes his place. Not a great opening half hour for Chery, but it must be said that it has been poor all round from QPR so far. Fulham are just relentless right now. A beautifully worked goal. Patience, precision passing and a ruthless finish by Ross McCormack. The Scotland international evades attention on the edge of the area and Tom Cairney finds Fulham's leading marksman, who places the ball into the bottom right corner. Robert Green had no chance in goal for QPR. Fulham really pushing for a third now. Ryan Tunnicliffe has QPR initially back tracking in a hurry. He looks for Ross McCormack and the danger is cleared. However, it is only a momentary reprieve. Gabriele Angella cuts out the ball at the near post as left-back James Husband bursts into box trying to find Moussa Dembele. Want another goal? Need a goal? Well, when it comes to Fulham and QPR there are two strikers that get the job done more often than not. Scotland international Ross McCormack, the Championship’s top scorer in 2013-14 with Leeds United, finished as Fulham’s top marksman in his first term with the Whites, scoring 19 goals in all competitions last season. McCormack has netted twice in the league this season. Uncapped Englishman Charlie Austin, who tops the second-tier scoring charts with seven goals in eight games this season, was the Premier League’s fourth top scorer last term with 18. Ben Pringle punishes QPR for failing to clear danger, collecting the ball following Gabriele Angella's sliding effort to clear. A touch, a look up and a sweet left-foot strike into the bottom right-hand corner. Almost, and perhaps should have been, an equaliser for QPR. A wonderful move of one-touch football ends gives Massimo Luongo a great opportunity, but he slices his shot wide from 12 yards. An outswinging Fulham corner falls dangerously into the box and Tom Cairney goes to ground under pressure from Alejandro Faurlin. The Fulham midfielder immediately appeals for a penalty.Nothing comes of it. QPR's Massimo Luongo looks to calm things down in midfield and moves the ball to the trusted feet of Paul Konchesky. While the attack breaks down, the movement of the ball to the Championship's leading scorer Charlie Austin is a reminder of the depth of talent QPR have to call upon. Moussa Dembele is always lurking, causing QPR's defence to keep a sharp eye out early on. The France Under-20 striker is hanging off the shoulder of his defender and is caught offside. QPR are leading the way when it comes to scoring goals this season and they are going to need to fire after going behind early. Judging by the early minutes, it's no surprise they have conceded 14 goals this term already. Fulham on top here - Ross McCormack lashes an effort into the side netting. There is incredible noise around Craven Cottage as the hosts are looking bright and full of confidence after Moussa Dembele opened the scoring after just one minute 57 seconds. An early goal in a local derby tends to perk any crowd up. A superb header from an unmarked Moussa Dembele put Fulham ahead inside two minutes. Moussa Dembele gives Fulham a brilliant start. The ball is swung in from the left and the 19-year-old rises highest at the far post to meet James Husband's cross. Six yards out and there was only ever one outcome. QPR get us under way and are kicking towards the home fans. Fulham in their traditional white shirts at Craven Cottage tonight, while QPR are in a menacing-looking black and red. If you have any thoughts on tonight's game, feel free to get in touch using #bbcfootball on Twitter. As the sun sets on Craven Cottage by the River Thames, a fast fading sky hangs soothingly overhead and crisp 15C conditions chill those in the stands ready for this west London derby. Things are sure to heat up as this is a fixture that has guaranteed goals in the recent past, with the last goalless draw coming at the dawn of the new century. Now Fulham boss Kit Symons was on the bench for that one at Loftus Road in February 2000. Fulham's Kit Symons: "It's a local derby. I've played in these games. They mean an awful lot to the fans. Both sets of supporters will be desperate for their team to get the bragging rights. I aim to make sure that, on Saturday morning, it's Fulham fans that are shouting the loudest." QPR's Chris Ramsey: "The main thing is to make sure we keep that professionalism up, like we did at Huddersfield where we didn't let a goal in, played well and scored. A lot of times, there has only been a draw available because we've shot ourselves in the foot." An April Fools’ Day defeat by Fulham at Craven Cottage left Queens Park Rangers on a slippery slope to Premier League relegation in 2013. The 3-2 defeat, in which Dimitar Berbatov struck twice for Fulham and Steve Sidwell was sent off for the Whites, saw QPR seven points adrift of safety with seven games left. QPR would go on to collect just two more points and be consigned to relegation four games later. Looking at the head-to-head, Fulham have won their last four home games against QPR, scoring 12 goals in that time. QPR have won just one of their last eight games against Fulham (D1 L6) failing to score in six of those games. If you're in the London area this evening, listen to BBC London 94.9 for live commentary of tonight's match at Craven Cottage. Unfortunately, a rights issue prevents us from broadcasting Football League commentaries on our website. However, you can listen to BBC London's pre-match show by clicking on the play button. QPRare unchanged from last weekend's 1-1 draw at Hull. Netherlands international midfielder Leroy Fer is fit enough for a place on the bench. Subs:Smithies, Hall, Tozser, Doughty, Gladwin, Mackie, Fer. Fulham make seven changes from their League Cup defeat by Stoke in midweek. Ryan Fredericks is in for the injured Jazz Richards at right-back. Subs: Lewis, Burn, Voser, Mattila, Christensen, Kavanagh, Woodrow. It is one of those weeks, when the near neighbours come knocking. But tonight, on the bank of the River Thames, we have a west London derby as Queens Park Rangers travel to Craven Cottage to face Fulham. Victory could take QPR up to third in the Championship, while a win for Fulham will see them return to the top half of the table. Team news on the way.